WARNING: This is not a DIY project for most homeowners. This is very dangerous work if you are not an expert, and in most communities, building codes may not even allow you to do this kind of major electrical work yourself. It requires coordination with the electrical utility company. This overview assumes that the electrical panel is installed on the wall of a utility area near where the main feeder wires come into the home, and that all branch circuit wiring cables and conduit runs are already installed. In a new home construction or a rewiring project, the last step will be connecting all the wires to the circuit breaker box, which is what this article describes. Your electrician's first step will be simply to mount the breaker box to the wall of the utility area where the main service wires are located. The assumption here is that the utility has shut off the power to the feeder wires temporarily while the panel is installed and the hookups are made. The electrician first makes sure the electricity to the feeder wires has been shut off by the power utility company. He will check the feeder wires with a voltage tester to ensure that this is the case. Normally the service wires will be entering the home through a large metal conduit, and the service panel will be attached to that metal conduit through an opening at the top of the breaker panel. The electrician now opens metal knockouts for the main service conduit as well as for each branch circuit that will enter the breaker box. The knockouts are the round metal discs visible in top, bottom, sides and back of the box, of various sizes to match different sized conduits that may need to connect to the box. He uses a chisel or old screwdriver to open the knockouts. He may do all of these at once, or start with only the knockout for the main service conduit, then open the knockouts for the branch circuits later. 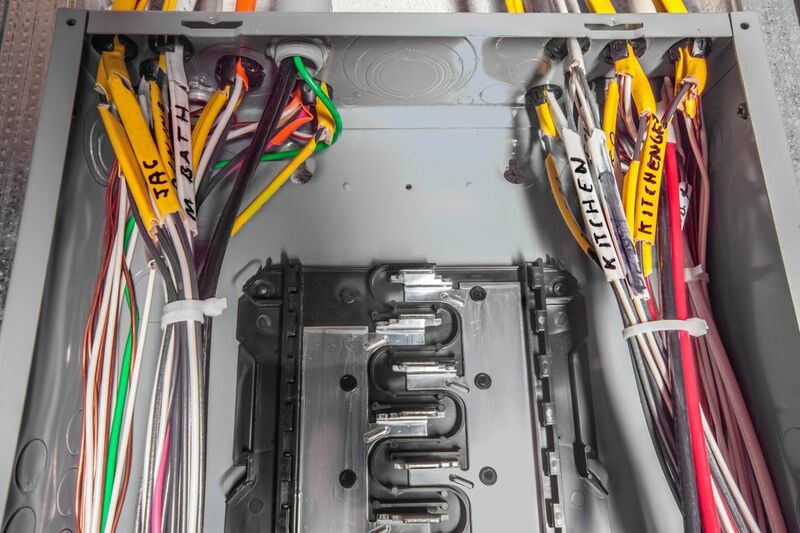 Once the knockouts are removed, the electrician installs the conduit or cable connectors into the panel, securing them with the knurled locknuts threaded onto the tailpieces of the connectors from the inside of the panel. Now, he levels the electrical panel and inserts screws through the holes provided in the back of the panel. If the holes don't align with studs behind the panel, he may drill additional drill holes in the back of the panel to accommodate the installation, or mount a piece of plywood to accommodate the panel. If the main service wires are entering the home through a conduit, the panel will be carefully positioned at this time so the conduit slides into the conduit fitting already mounted on the service panel. The main grounding wire--usually a fairly large bare copper wire--is connected to the main grounding connection on the panel. Usually this is a metal lug on the back of the metal panel. If the service wires are not already present, the electrican will now feed a fish tape fthrough the main service conduit opening from inside the panel to the entry point where the main service wires are available. The main service wires are now secured to the end of the fish tape with electrical tape and pulled back down into the breaker panel. It may require a helper to assist pushing the wires from outside while the fish tape is pulled from the inside. Plenty of excess wire is pulled into the panel to allow for connections to be made anywhere in the box. The electrician now bends the two black service wires for easy installation to the main breaker. In most panels, the main breaker is a large 240-volt circuit breaker that is located at the top of the panel. It will control all the power entering the home and connects to both hot buss bars running down vertically through the panel. The ends of the service wires are stripped of just enough insulation to make the connections to the main circuit breaker terminal lugs. He takes care not to leave excess bare wire, because this creates a safety hazard if the wires can come in contact with other wires. The bare ends of the main service wires are inserted into the lugs on the main breaker, and the screws are tightened securely. The main service neutral wire is now connected to the neutral buss bar. The location of the neutral buss bar varies depending on the panel manufacturer, but it is always located well away from the two hot buss bars. It is a silver-colored bar with many smaller screws and connection points, with one larger hole for the main service neutral wire. On NM cable, the out plastic sheathing of the cable is cut away so that just a small portion remains where the cable enters the panel. For each cable, the electrician will strip away a short length of insulation from each individual metal conductor in the branch wires. The use of a special stripping tool assures no damage to the wires within. Connects for all of the green and bare copper wires are now made to the ground buss bar. The white neutral wires are connected to the neutral buss bar. Many electricians use a wire numbering kit to identify which neutral wire goes with which circuit number. This makes removing a circuit later easier. Excess wire is neatly looped along the sides of the panel box. Leaving plenty of excess will make possible repairs or replacements easier in the future. Now, the branch circuit hot wires are connected to the branch circuit breakers, using the lugs on the breakers. The breakers have been carefully chosen to match the required amperage and voltage of the circuits and to meet code requirements. Some circuits, for example, may be wired with GFCI breakers or other specialty types. The 120-volt circuits will normally be 15- or 20-amp circuits, wired with 14- or 12-gauge wire, respectively. These branch circuits will use three wires--a black or red hot wire, a white neutral wire, and a bare copper or green ground wire. 240-volt circuits, on the other hand, will connect to double-pole circuit breakers and will use two hot wires--normally a black and a red wire--plus a white neutral wire and a bare copper or green grounding wires. The excess wire is looped neatly along the side or bottom of the metal panel box. The cover of the circuit breaker panel is installed, and the electrician now has the utility company turn on the power, and concludes by making sure all circuits in the house are operating correctly.